NAID® and PRISM International™ are proud to offer a comprehensive information lifecycle management conference under the newly formed International Secure Information Governance & Management Association (i-SIGMA). The annual NAID conference has always been the most comprehensive gathering of secure shredding operators worldwide; now, with PRISM International the joint event represents all four pillars of records and information management: physical records and information storage, data protection and media vaulting, digitizing and scanning, and confidential records and information destruction services. 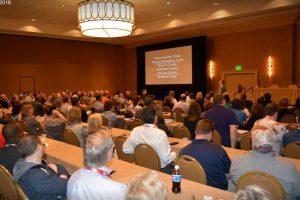 Keep up-to-date with the latest trends in secure information governance and management as well as best business practices for the industry when you attend the 2019 Conference & Exposition presented by NAID and PRISM International in Denver, CO at the Gaylord Rockies Resort & Convention Center. Exhibit hall booth space is limited. Contact Jamie Hughes today to reserve your space in the Exhibit Hall and get in front of 1,000 RIM and information destruction professionals. Put your company name in front of nearly 1,000 professionals. Talk with Jamie Hughes about which Sponsorship or advertising opportunity would work best for your company. – Apr. 11: The conference begins!